Pups United is a feel-good family film featuring soccer and dogs. I rate it a little higher than the 3 other dog-centric soccer movies I’ve seen. The soccer is pretty good, and the two bad guys (Andrew Tarr and Paul Lang) are pretty funny. In the following soccer movies and football films, dogs play major roles in the stories. Even though I am not a soccer-playing dog lover, I found the first 3 films to be entertaining, and the fourth film, Pups United, might be the best of the 4. It’s kind of strange that, of the little information on the web about Soccer Dog: European Cup, most of it is incorrect. Back in 2012, the imdb description used to say that this movie was about a pornstar running a Scottish team. Other sites say this sequel to Soccer Dog: The Movie is about an orphan, a tournament, etc. They’re all wrong–I guess no reviewers really watch these movies when they’re about a dog. 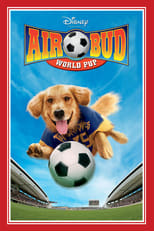 In the Disney Air Bud franchise, a dog named Buddy plays on all the sports teams at a high school. In Air Bud 3: World Pup, Buddy’s owner joins the team because of the new girl from England (who is the best player).